My Father started working for the Post Office in December, 1971. We were living in Mississauga, Ontario at the time. Even at the young age of thirteen, I knew when somebody was shooting me a line. “Oh, come on dad…” I said to him. He did not hesitate for one moment before answering me. “Oh yes, I believe her, in fact there is no doubt in my mind,” he replied. 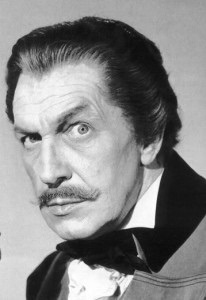 “And what makes you so sure that she is actually Vincent Price’s cousin?” I asked. His face suddenly became very serious. I loved my Grandmother very much. She knew instinctively what it took to make her grandchildren happy. Ice cream was one of those ways. With an obeying nod, I solemnly gave her my promise. Yes, we loved ice cream, but Grandmother loved ice cream even more. My Aunt once shared with me that when Grandmother came to visit the family for several weeks, she always left a little rounder than when she first arrived. I have no doubt that this stemmed from sharing her love of ice cream with all of her grandchildren. So, now that she is no longer with us and has been taken up to heaven, I cannot help but wonder if she is in any way able to get a double dip. As Christians, we were always taught that “God will provide.” Some would say that God will provide us with our needs. Well, I know for a fact that for my Grandmother ice cream was a necessity. So, when I get to heaven, I fully expect her to immediately take me quietly aside.